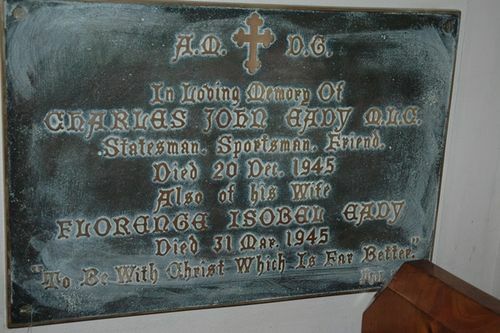 Plaque commemorates sportsman and politician, Charles John Eady. Playing for Tasmania against Victoria in Hobart in early 1895, Eady became the first Australian to make a century in each innings of a first-class cricket match—116 and 112 not out. This feat attracted great attention, but it was as a fast bowler that he was selected for inclusion in the Australian team which went to England in 1896 under G. H. S Trott. He played in the fifth Test in the 1901-02 series in Australia. He won the Tasmanian Cricket Association bowling average several times, twice taking ten wickets in a match; his 1902 score of 566 for Break O`Day Club v. Wellington still stands as a record in any grade of Australian cricket and is listed in Wisden. In 1908 he retired from first-class cricket. He had been involved with the administration of the game from 1890 and was elected president of the Tasmanian Cricket Association in 1926, holding the position until his death i 1945. He was also President of the Tasmanian Legislative Council from 1944 to 1945. In loving memory of Charles John Eady M.L.C. "To be with Christ which is far better"